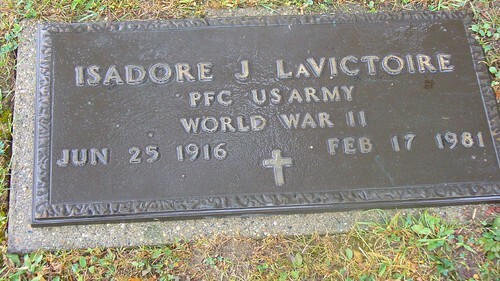 My father-in-law, Isadore, was a World War II veteran. He saw action in France and Africa. He was severely injured in the war - the family joke goes that he was 100% disabled so he came back and fathered 9 children! Mr. Pete says his dad never spoke about the war. Once his daughter asked him why he never went to any of the reunions with his war buddies, and her dad answered because none of his buddies made it back. His body was riddled with shrapnel after a bomb exploded over head. Some of those pieces remained with him always and irritated his heart, which eventually lead to his death. But there is a sweetness to his story. While he was in the hospital after his injuries he started receiving letters from Virginia, the girl he would eventually marry. It seems that one of her friends had been writing to a lot of servicemen and just couldn't keep up with all of the correspondence. So she gave Isadore over to Virginia and she started writing to him. They fell in love, got married and raised a large wonderful family; Mr. Pete was their 8th child. He was really a patient, kind and loving dad. Mr. Pete tells me that every year when he was little they would pile into the car for midnight mass, and when they got back from church the tree was up and the presents were under it. We still wonder how he managed to pull that off! Did his dad have all of it hidden and pull it out at the last minute? or did he have a neighbor in on it to help him? We'll never know. Another favorite story is the time that the family dog, Chum, died. Isadore and Virginia and all of their crying children got in the car to go and give Chum a proper burial in the country. For some reason (and Mr. Pete does not remember why) a cop pulled them over. What a sight that must have been! All those little sad faces and a dead dog! Apparently Isadore was able to explain it all to the police officer, because he let them go with only a warning. When I met him in the late 1970s, Isadore was retired from the auto industry, still active with his kids in high school, working with the band boosters, and being an active grandpa for some very young grandchildren. Two of my fondest memories of him include the time he came to pick Mr. Pete and his siblings up from school. He came in the family station wagon and he was wearing a very stylish Farrah Fawcett wig, pretending that everything was as usual. Of course kids were laughing and Pete et al didn't know whether to laugh too or to be mortified. It was all in good fun. 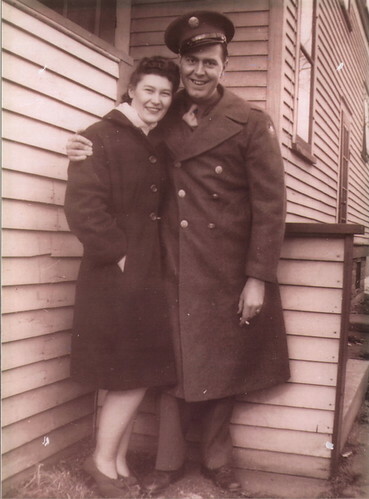 I also remember our first New Year's after we were married and my Father-in-Law wore some dark sun glasses that lit up when he pressed a button in his coat jacket (a leisure suit!). The DJ that night was so impressed, he played the ZZ Top song, Cheap Sunglasses, in his honor, which of course Isadore got right up and danced to! Everyone laughed and applauded. That was a great night. My daughter Izzy (Isadora) is named for her grandpa. We all really miss him, but I do enjoy sharing those stories about him with my kids, especially on Veteran's Day!